圖1. ICN上面的黑爪E. 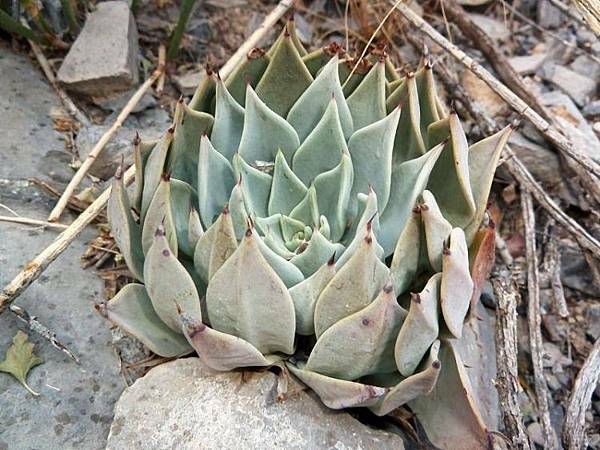 cuspidata var. cuspidata. 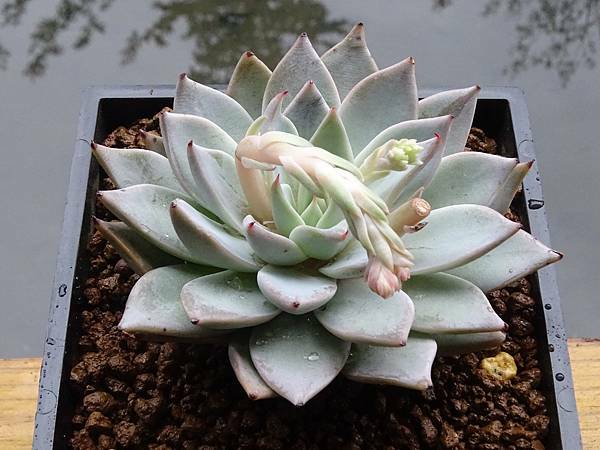 Note : The name "parrasensis" does not indicate a different clone of E. cuspidata. 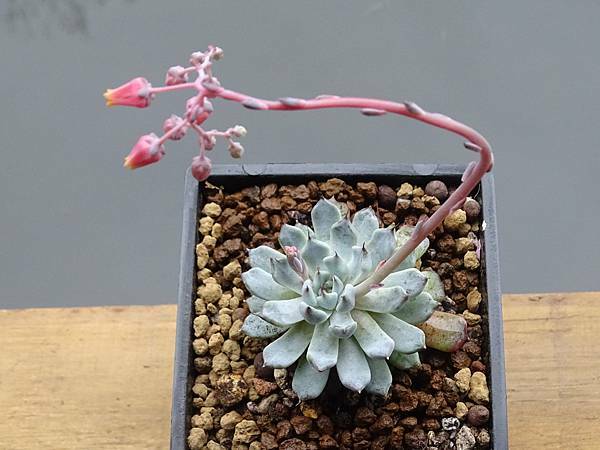 E. Walther has succeeded in describing two plants from the same locality with two different names ..... That means E. parrasensis is identical with E. cuspidata. The name "parrasensis" is entirely obsolete. Stem short, 5 – 7 cm usually, 10 – 15 mm thick. Rosettes usually single, 10 – 15 cm wide. 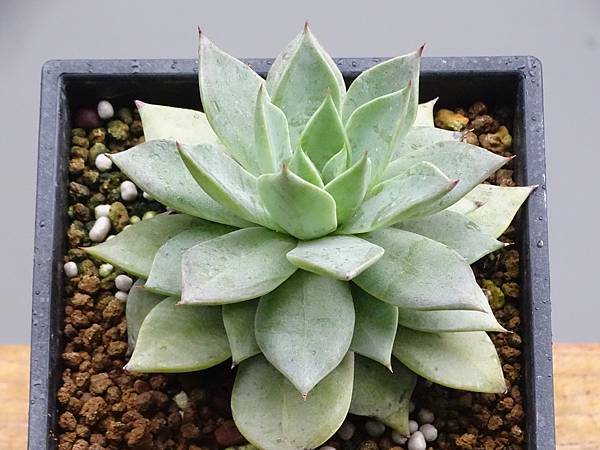 Leaves 24 – 40, 3 – 7 cm long, 15 – 30 mm wide at widest part 1 – 2 cm below apex, 3 – 5 mm thick, obovate to obovate-cuneate, quickly narrowing within 2 cm from apex, mucronate-apiculate, glaucous, gray to bluish green, mucro or awn reddish, lacking a keel on upper surface. Inflorescences single to several, usually branched, rarely bifurcate, 24 – 45 cm long, pinkish white to pinkish orange; bracts ascending, linear-lanceolate, 10 - 15 mm long; pedicels ascending, 15 – 25 mm long, pinkish. 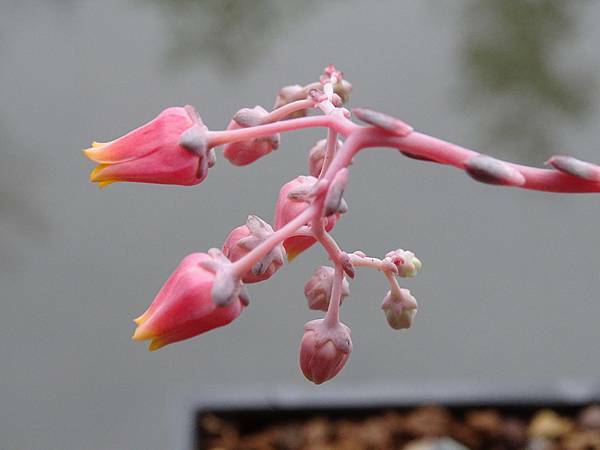 Flowers : Sepals unequal, nearly appressed to expanding, 1.5 – 10 mm long, pinkish to bluish grey, corolla urceolate, ca 12 mm long, 5 - 6 mm thick near base, 4 mm in diameter at narrowest part, petals expanding slightly at apex, bright orange outside, paler inside. 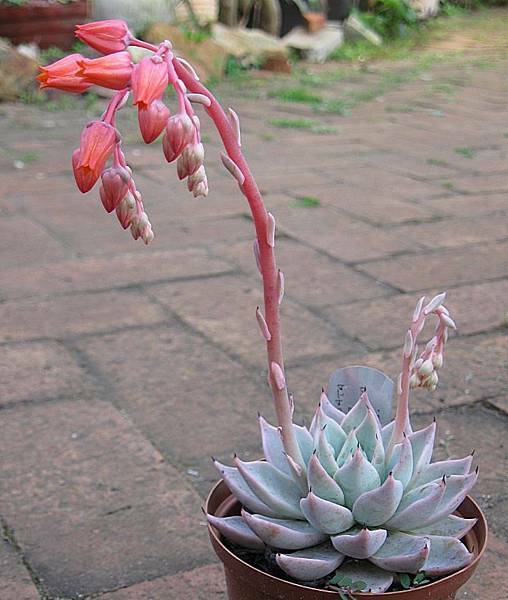 Echeveria cuspidata is a very variable species. Var. cuspidata is a much bigger plant than either var. zaragozae or var. gemmula. But the flowers of all clones are almost identical. he differences between E. cuspidata var. gemmula and E. cuspidata var. zaragozae are insignificant and do not justify two varieties. According to Etter & Kristen, the type localities of the two plants are only 100 m apart. 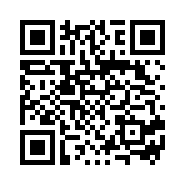 It is sufficient to distinguish between E. cuspidata var. 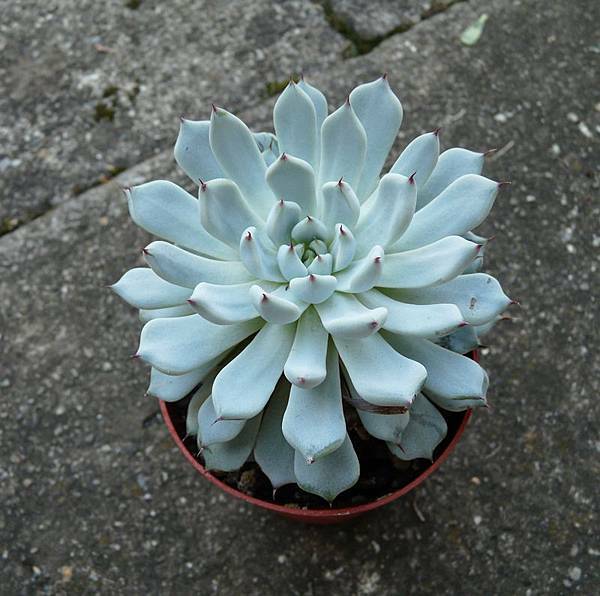 cuspidata which is a bigger plant with a distinct leaf shape and a smaller variety. Stem up to 6 cm and more, 2 – 2.5 cm thick. 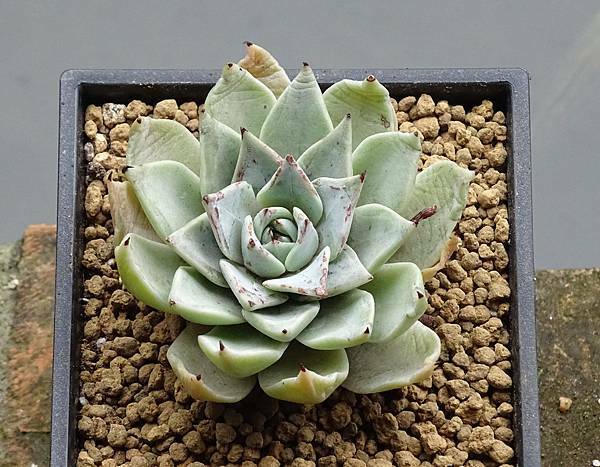 Rosettes usually single, 9 - 11 cm wide, 5 – 6 cm high. Leaves 60 - 80, 30 – 40 mm long, 8 – 12 mm wide near apex, upcurving (erect when young, horizontal when old), oblanceolate, aristate, awn 2 – 4 mm long, reddened; bluish white waxy covering. Inflorescences 2 - 4, 12 - 35 cm long, with 4 – 14 flowers per cincinnus, pinkish orange; bracts linear-lanceolate, 2 - 11 mm long, pinkish orange; pedicels 8 - 18 mm long. Flowers : Sepals unequal, ascending, 1.2 – 5 mm long, glaucous, faintly purplish, corolla urceolate, 9 - 11 mm long, 6 - 7 mm thick near base, petals expanding at apex, orange outside, yellowish inside. Stem 1 – 4 cm high, 7 – 9 mm thick. 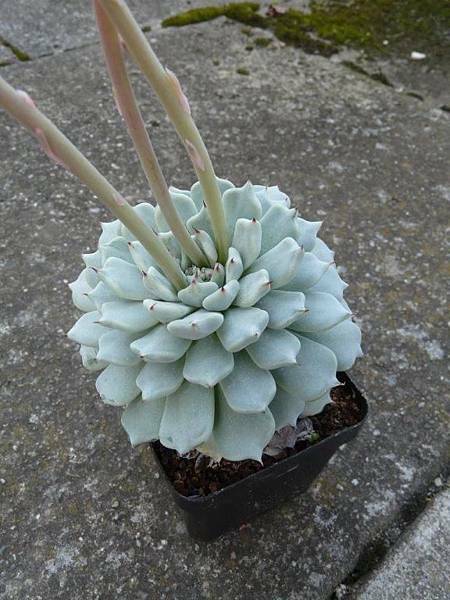 Rosettes usually single, up to 10 cm wide and up to 6 cm high. Leaves 30 – 70, erect when young, slightly deflexed when old, obovate or obovate-cuneate, with prominent purplish red mucro up to 2 mm long, upper side often with a paler coloured central keel, lower side strongly convex, up to 5 cm long and 1.6 cm wide, bluish green. 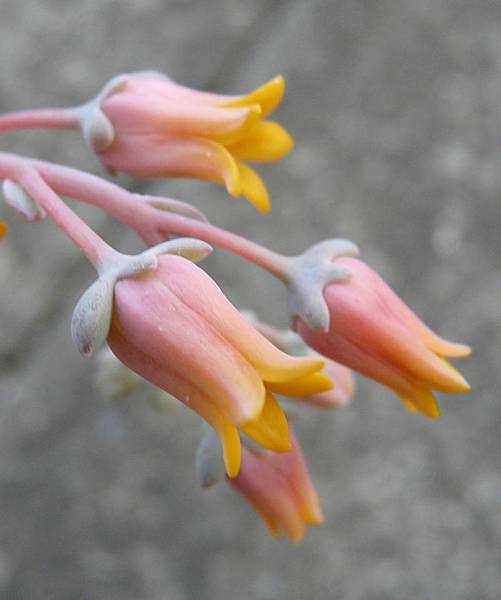 Inflorescences 1 – 3 with 1 (-2) unbranched cincinni, 11 – 23 cm long, pinkish orange, slightly glaucous;bracts linear-lanceolate, 2 – 8 x 1 – 4 mm; pedicels 8 – 18 mm long, pinkish orange. Flowers : Sepals expanding slightly at apex, unequal, purplish orange, up to 3 mm long, corolla urceolate, 10 – 13 mm long, 6 – 8 mm thick near base, orange, petals expanding slightly at apex, pinkish yellow inside.